George Miller is nothing if not diverse in his directing choices – from heart-breaking medical dramas like Lorenzo’s Oil to fantasy-comedies like The Witches of Eastwick, and even family films like the underappreciated sequel Babe: Pig in the City and the Oscar-winning Happy Feet (and its lesser sequel, but the less said about that one the better). But with the Mad Max films, starting with 1979’s entry with then-newcomer Mel Gibson taking the title role, and then continuing with its more popular sequels The Road Warrior and Beyond Thunderdome, Miller has also proven to be a perfectly solid action director. It’s a wonder, then, why it’s taken him thirty years to not only provide a new film in that franchise, now known as Mad Max: Fury Road, but also make his first pure action film since the third one. But boy howdy, was it worth the wait. Unlike any action film you’ll probably see the rest of this year, perhaps even this decade, Fury Road somehow manages to combine a compelling story of simplicity, engaging characters and even strong gender politics in a film that has more testosterone and explosions than any Michael Bay film combined – and it WORKS. It’s mind-boggling how a film this dumb can be so smart at the same time, and not just in what it’s saying but also how it manages to keep its audience entertained from the very first frame. A lot of this seems to be down to how Miller has, for the most part, kept strictly to practical effects and real stunt work to bring the epicness to life. Aside from a few obvious uses of computer graphics, such as a standout scene in the midst of a sandstorm and even a borderline-cheesy 3D shot nearer the conclusion, these are all real cars being driven about on set, real weapons that characters are using against one another, real sets that for the most part don’t seem to have a touch of green/blue-screen about them. It’s all actually there, and it makes the action all the more intense because you know for a fact the people on-screen, whether they’re actors or stunt-people, actually had to go through this on set. If it was as intense as it is in the final film, it’s a miracle in and of itself that nobody (probably) died during the making of this movie. For that, we applaud Miller and his ballsy stunt team for going the extra mile to making sure we get action that is not only impressive but also not faked by computers. Some great design work, especially on the vehicles which range from spikes to bizarre combinations of cars and tanks, certainly elevate this further than expected, making the Fast & Furious films look flaccid by comparison. The action may be real, but is the intensity? The tight camera work, stunningly lensed by cinematographer John Seale, quick-fire editing, restraint from NOT using too much shaky-cam to a point where we can’t make sense of what’s happening, and how Miller plays around with frame rates at times – a pre-title foot chase sequence appears to have been sped up accordingly – all point to a resound “yes”. Miller also brings a particular style that’s all at once beautiful and shockingly uncomfortable, creating a world that is frightening as it is inviting. 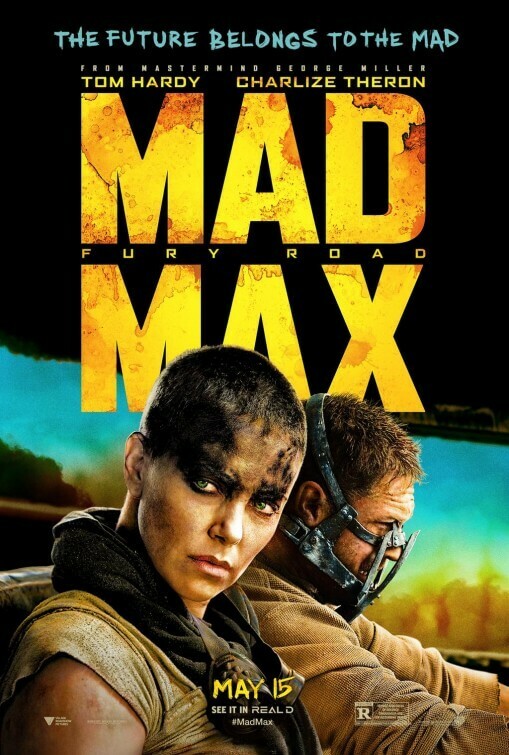 From intense close-ups of characters’ faces, such as the creepy toothy face-mask of loathsome antagonist Immortan Joe (Hugh Keays-Byrne) or the cracked lips of loyal warrior Nux (Nicholas Hoult) or even the imprisoning mask worn by Max himself (now played by Tom Hardy after Gibson, ahem, wasn’t available) throughout a good portion of the first half (insert Bane reference here), to disturbing visions of the people our titular character supposedly couldn’t save from death’s path previously, Miller truly wants us to know what a maniacal and, yes, mad world it is that he’s brought back to the big screen, and you can’t help but get sucked in to all of it when it’s throwing such imaginative insanity at you. This sounds like one testosterone-heavy film, but what may truly surprise is the strong amount of estrogen this movie brings as well. The main hero may indeed be Max, to whom Hardy brings a much quieter and more hard-boiled interpretation than Gibson could have accomplished, but you can make the much stronger argument that the real hero is in fact Charlize Theron’s aptly-named Imperator Furiosa. This Ripley for the 21st century is a one-armed, hair-shorn former slave whose act of defiance against her captors by stealing away Immortan Joe’s prized concubines (played by Rosie Huntington-Whiteley, Zoe Kravitz, Riley Keough, Abbey Lee Kershaw and Courtney Eaton) leads to an all-out vehicle war, and she is an incredibly magnetic (figuratively and, given her metal prosthetic arm, literally) action lead that can draw you in physically as well as emotionally, more than proving her worth in the dozens of action scenes the film has to offer. It is fascinating how, in a world overcome by insanity and greed, it is the men who are the most animalistic and bloodthirsty while the women are mostly unscathed, proving to have stronger willpower and intelligence than many of their “owners” and are thus stronger than they realise – there’s a reason that the film feels the need to remind us that women are “not things”, because that’s exactly how they are treated by the men who don’t know any better about how useful they truly are. The larger women, for instance, are seen being endlessly pumped for breast milk, and it’s no wonder they all look so bloomin’ miserable. This film excels at giving us genuinely powerful female characters you actually want to root for and not out of guilt, and as long as they can shut those bloody Men’s Rights Activists hooligans up then all is well. This is a film that gives you everything you could want out of a great action movie: incredible set pieces, tons of explosions, rapid gunfire and even a flamethrower electric guitar, and also a fair balance of character and subtext to even things out a bit. It’s truly astonishing how Miller and his crew have managed to put together something that by rights should be a Waterworld-style failure of epic proportions, but against the odds has come out sparkly clean and incredibly inviting. It’s certainly not for everyone, especially those who feel that the stylisation of everything is too much to take in (we recommend seeing it at least twice, first to take in the spectacle and second to soak up what else it’s trying to convey), but this is a modern action masterpiece for everyone else. We certainly hope it doesn’t take George Miller another thirty years to make another Mad Max film or indeed another action film period, because if Fury Road is anything to go by, we may have a new undisputed king of the genre – and it’s the same guy who previously made a film about dancing penguins.